We return to the theme of writers and writing. We have a piece on Russia’s president Putin who has been doing his best to develop a media that is loyal to his concept of corporate Russia. — 391 words. You must swear before you take the stand. You may swear on the job. Judge Wright puts it this way. — 292 words. If you have a Canadian $10 bill, look at the back right side of the bill You will see a veteran standing at attention near the Ottawa war memorial. — 339 words. Is Our Food Any Safer Since the Last E. Coli Outbreak? Farmers are now forced to comply with an array of new food safety measures, some of which are scientifically unproven and environmentally harmful. — 4,855 words. SINGAPORE, Malaysia - Formula 1's governing body, the International Automobile Federation (FIA), has given the green light to hold Formula 1's first night race. — 123 words. LONDON, England — Alexander Litvinenko, the former Russian spy who was poisoned in a London hotel, worked undercover for the British secret service MI6, it has been revealed. — 331 words. The 17th Chinese Communist Party Congress closed last week by putting the spotlight on the rising political fortunes of businessmen. It's a striking change for an authoritarian party whose declared mission is to defend the proletariat from the capricious whims of exploitative capitalists. — 1,029 words. The Washington Post leads locally but off-leads news that the State Department is planning to fill up to 50 vacant positions in Iraq by forcing members of the diplomatic corps to go there, the first time such an order would be made since Vietnam. — 173 words. To great fanfare, last year the UN's witch-finding inspectors, the Office of Internal Oversight Services (OIOS), announced that they had nailed a Singaporean staff member, Andrew Toh, for corruption. To considerably less fanfare, this month the Singapore government revealed that the UN's internal courts had cleared Toh of any substantial wrongdoing - and found that the OIOS had harassed him and spent millions of dollars investigating him without any success on the main charges. — 901 words. After Vladimir Putin's announcement that he would not be averse to becoming the next prime minister, the prevailing guess is that after the March 2 presidential election he will head the Russian government under a new president. Yet before anyone begins to design a Russia policy based on this, its plausibility has to be examined. In the light of what we know about Putin and the political and economic system he has forged, he is more likely to find a way to continue in office as President Putin. — 1,161 words. Genocidal tyrant Rupert Murdoch suffered much abuse after his News Corp. offered the Bancroft family $5 billion last spring for Dow Jones & Co. I took a place in the rock-throwing gauntlet that Murdoch was forced to run and pelted him with his own sordid history to illustrate what a wretched steward of the Wall Street Journal and the other Dow Jones properties he'd be. Even after the acquisition was a done deal, I kept hurling my missiles. — 981 words. Where does the right-wing end and the media begin? It's more than a bit surprising when the guy from the New York Times sounds more radical than anyone else in the room, but Krugman and his twice-weekly column have been more consistently surprising and radically different than anything else allowed to appear in the Times (or indeed anywhere else in the so-called "mainstream media") for so long that even Krugman himself no longer seems surprised by the force of his own outrage. — 2,054 words. 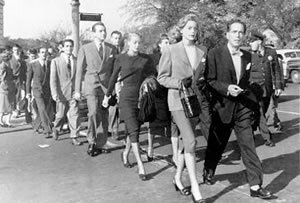 Stars on the march: Silver-screen luminaries Lauren Bacall and Humphrey Bogart lead the way during a protest against HUAC during the height of the Hollywood Blacklist controversy. Sixty years ago, as wicked witch-hunters descended upon the movie industry, Judy Garland took to the microphone for a coast-to-coast radio program called “Hollywood Fights Back!” Instead of singing, the 25-year-old starlet asked Americans: — 4,552 words. What Do Billionaires Herbert and Marion Sandler Want? The first American press was the partisan press, underwritten and dictated by the political parties. Starting in the 1830s or so, the profit-seeking lords of the commercial press staked their major claim to the news business and established a primacy they have maintained to this day. — 771 words. Harold Wright, Doctor of Punology, says, A bicycle can't stand alone; it is two tired.